Peanut plus chocolate is always a great combo together if you ask me. The slight saltiness of the peanut butter complement the creamy sweet chocolate. I have seen a lot of food companies in the last couple of months coming out with peanut butter and chocolate foods like coffee creamer and a doughnut chain coming out with a doughnut with a chocolate glaze and peanut butter drizzle. You would think that they would come out maybe around Halloween time, it is just around the corner I need to find a countdown, because the colors look like black and orange. These cookies are chocolaty and fudgy like a brownie with slightly saltiness of peanut butter. Yum! I tried a new-ish product for this recipe, peanut butter powder, for the drizzle. 1.) In a medium sauce pan on medium low heat melt butter slowly. Set eggs out to bring to room temperature. 2.) As the butter is melting, combine flour, unsweetened baking cocoa powder, salt and baking powder. Set aside. 3.) Add unrefined sugar, dark brown sugar and 1 1/2 cups semi-sweet chocolate chips. Bring it to a slight boil then whisk in vanilla extract. Let it slightly boil for 5 minutes. 4.) Remove chocolate sugar mixture and let it cool for 15 minutes. 5.) Once chocolate sugar mixture has cooled add to flour cocoa mixture. Fold in milk chocolate chips and last 1/2 cup of semi-sweet. 7.) Once it has cooled fold in peanut butter chips then place back into for another 1 to 2 hours. 8.) Preheat oven to 325o degrees, line cookie sheets with parchment paper. Scoop out 2 tablespoons of dough, placing cookies at least 2 inches apart. 9.) Bake for 10 to 12 minutes. Rotating the pan after 6 minutes. They will be slightly gooey in the middle. Let cool on cookie sheet for 10 minutes then transfer to a wired rack and let them cool completely. 10.) Melt coconut oil. Whisk in peanut butter powder and sea salt until slightly thick. 11.) Drizzle peanut butter over cooled cookies. Place in refrigerator until drizzle is completely set about 15 to 20 minutes. Store cookies in a cool place. yyyyyyummmmmmmmmmmm! Peanut butter and chocolate are my favorite combination! This looks DELICIOUS!!! I love Peanut butter and chocolate. I can't wait to make this myself! I'm going to have to make these for Halloween! My husband will go absolutely bonkers for these. Those look seriously amazing. I am addicted to the PB and choco combo! Omg these look freaking good and I've never heard of peanut butter powder. I need to look it up. I made box brand brownies and added reeses peanut butter cups on top. Super good so I know these probably taste even better! Yum how tasty. Our normal biscuit recipe has been falling a bit flat lately so I'll definitely want to check this out. My daughter's favourite snack is nutella and peanut butter on toast. Peanut butter and chocolate are awesome together! I'm wondering if there is an almond or cashew butter chip available for those with peanut allergies? I'm not sure if they do, pretty sure that if you look on Amazon you might be able to find them. Excuse me while I drool all over. These look so delicious. These sound absolutely delicious! My son would love these for an after school snack! Oh wow. Drool worthy! I would love to try these. Well these look like the perfect sweet treat for an afternoon pick me up. I would love one with a latte any afternoon for sure. You're right, these do look perfect for Halloween. I also love the combo of peanut butter and chocolate! I love peanut butter cookies! I wonder if I can try this by just swapping the peanut butter chips for just little gobs of peanut butter. I don't think I can get the chips around here. All I can say is, fill up my coffee mug and pass me about a dozen of those cookies. I am showing this to my hubby, and he is shaking his head yes. These look amazing, a perfect snack. I would love making these as peanut butter is my favorite. These cookies look absolutely scrumptious! Two great flavors in one cookie! Yes, please. OMG!!! These look decadent! I wonder if I can make them with gluten free flour! They sound so yummy I'm literally mouthwatering! Of course you can use Gluten free flour. These sound amazing and look even better! I like it doesn't call for added sugar. These may be in the oven soon. Woah!! 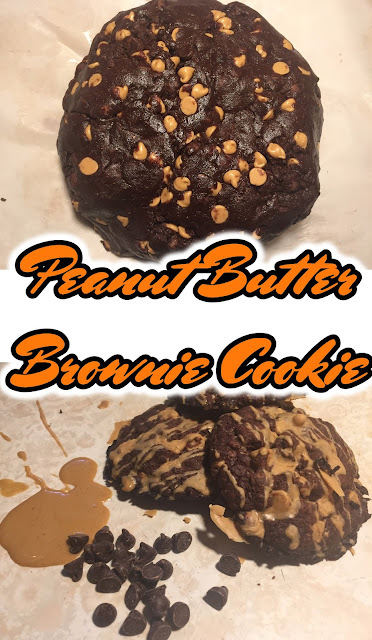 That peanut butter brownie cookies looks so tasty and delicious. I am pretty sure that my daughters will really love this. Those cookies look amazing! What a great snack. This is cookies of my dreams! I love chocolate AND peanut butter. What a juicy combination! Wow peanut brownies I love to eat this one when I was smaller, I can't wait to try your recipe thanks for sharing. You had me at peanut butter! And what a combo, my little boy is going to love this recipe! We can't wait to try it out! I could eat those all day long!!! No better combo to indulge on than chocolate and peanut butter! You had me at peanut butter and chocolate - I love the sweet and salty combination. I really like the sound of a brownie texture to your cookie, I bet they're delicious. It's the best combo ever. These cookies look scrumptious! What a great flavor combination! Super yummy looking good eats! Love it and I'm drooling over lol! Oh my gosh these cookies. WOWOWOWOW. I am like melting right now these look so hot. LOL. Totally down. I just need to make these gluten free. Omgoodness these peanut butter brownie cookies look absolutely glorious. My children and grandchildren would be in heaven to see these coming hot out of the oven. I'll be putting these on my holiday cooking list.